The implant allows the woman to accurately move a cursor on a computer by just thinking about it. In 2005, researchers from Brown University in Providence, RI placed a silicon electrode array in the brain of a 50-year-old woman who had been paralyzed - unable to move or speak - since she suffered a stroke in the mid-1990s. 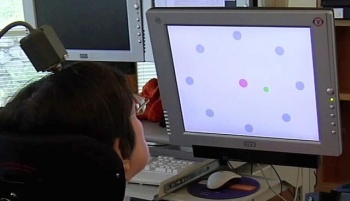 The array, about the size of a baby aspirin pill, was able to read electric signals in her brain and allow her to pinpoint a cursor on a computer screen by imagining the movement of her hand. The implant worked well, but the scientists purposefully left the implant in the head of the patient referred to as S3 to test how long a device would last inside a human body. A paper released this week reported that, 1,000 days after the implant was installed, it still functioned relatively well, hopefully proving that long-term neural implants are no longer science-fiction. The question is: where can I get one? "This proof of concept - that after 1,000 days a woman who has no functional use of her limbs and is unable to speak can reliably control a cursor on a computer screen using only the intended movement of her hand - is an important step for the field," said Dr. Leigh Hochberg, the director of the BrainGate project. BrainGate is a combination of the hardware of the implant and the software that translates the electrical pulses of the brain to movement on a screen. The tests that S3 underwent were meant to approximate clicking on an application's menu bar, with some targets as small as an icon on your desktop. "Our objective with the neural interface is to reach the level of performance of a person without a disability using a mouse," said John Simeral, another researcher on the team and the author of the paper. The team admitted that not every neuron fired as well as it did when it was first installed, but the clinical trial at least proved that more permanent implants were possible. All of the problems were from mechanical or engineering design flaws, and could be corrected with further refinements. The tests being reported on now were actually conducted in 2008, and a full clinical trial is currently being organized by Dr. Leigh Hochberg and her team. We may eventually see these implants as an option for people who have no options. The BrainGate project is amazing, not only because it shows that many of the gameplay elements we take for granted, say in Deus Ex or BioShock, could actually happen, but because of what it means for humanity. Synthetic body implants are usually considered for cosmetic reasons or to create a "super-soldier" from an already capable human being, but this BrainGate implant allows disabled people a human experience on par with the rest of us. With this implant, Stephen Hawking would be able to play Myst - at least easier than he could now. And that's just awesome.